Adorn this dazzling and stylish accent piece into your decor to enhance your home interiors. This side table features checkered pattern of sleek reflective material. It is covered with 4 mm tempered glass panels and 4mm silver mirror panels that together reflects a modern charm in your living room aside sofa. The three spacious drawers provides a secure placement to your remotes, magazines and other related items. Made up of glass and mirror with crystal accents. 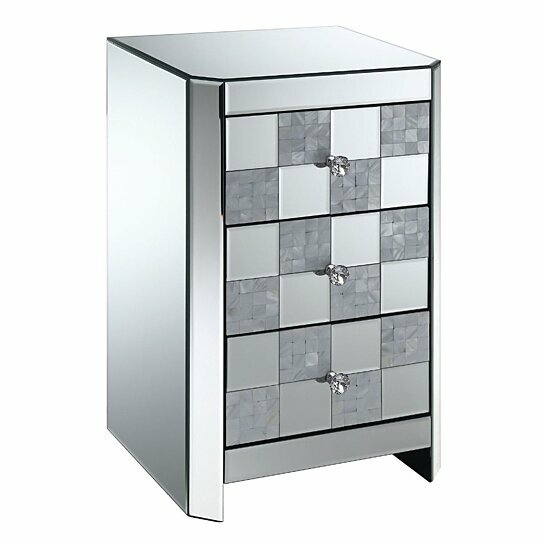 It features three spacious drawers with crystal knobs for easy opening. Ideal to place in your living rooms to display items on the top and to store in the drawers as well.